I landed in the capital of Rajasthan this morning at 7.00am after a gruelling 22 hours and three flights. Jaipur international airport is newly built and is a vast improvement on the old airport. While on the subject of airports I had a bit of a shock when I arrived in Delhi late last night. It took just two minutes to clear passport control! I was amazed at the speed and efficiency of an airport where I have previously experienced 24 hour delays and rioting passengers. I came back to earth with a bump however when I had to wait 45 minutes to get my luggage due to the carousel having a bit of an off day. I truly realised I was in India when I stepped outside and witnessed two slightly built Indians attempting to bump start a full sized coach. It felt good to be back! First port of call today was to visit a small factory based in the industrial area of Jaipur. The factory is run by "the old man". 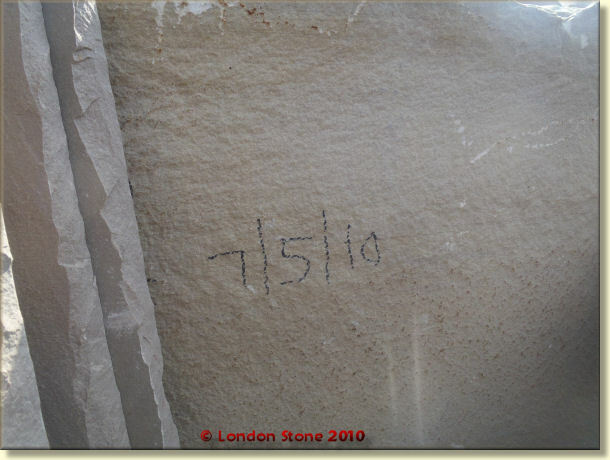 "The old man" is an engineer by trade and about 15 years ago decided to get into the stone business. As a skilled engineer "the old man "manufactures all of his own machines. 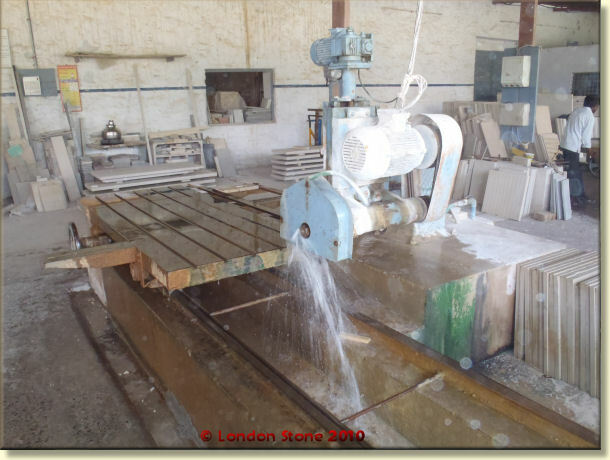 "The old man" specialises in value added natural stone items such as sawn sandstone and various other types of bespoke pieces. The first time I visited this factory 3 years ago I was amazed at how much work was done in such a small place. 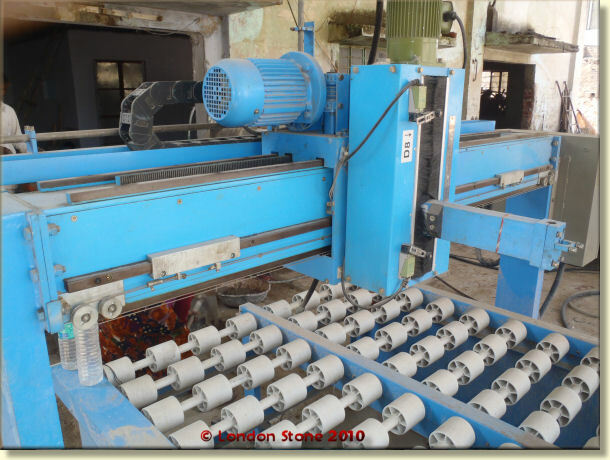 It was an efficient and extremely productive operation which churned out very high quality finished product. It would not be correct to mention any names but I also discovered that "the old man" was supplying one of the big paving companies in the UK (think of the top 3 household names in the UK and its one of those companies). 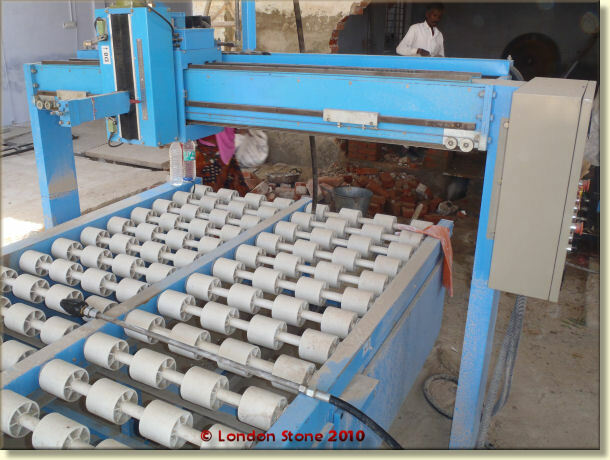 If you spend any time driving around Rajasthan there are literally thousands of small companies like this churning out stone for the local, national and international markets. 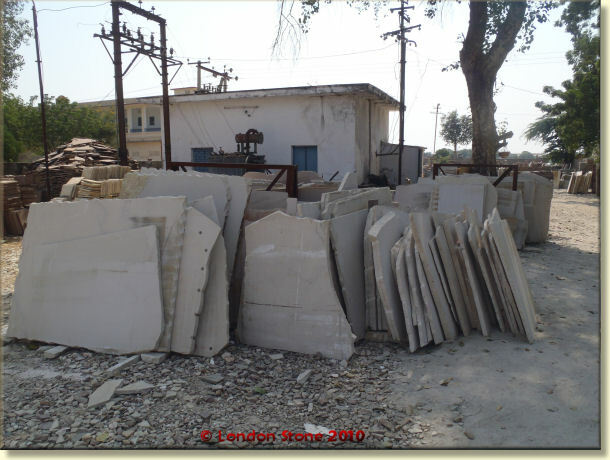 In that respect you realise how fragmented the natural stone industry is in India and how hard it will be to implement any standards, particularly in relation to ethics. I was glad to learn that there was a positive reason for the lack of activity. "The old man" was in the process of modernising the plant with the installation of two state of the art water processing machines. 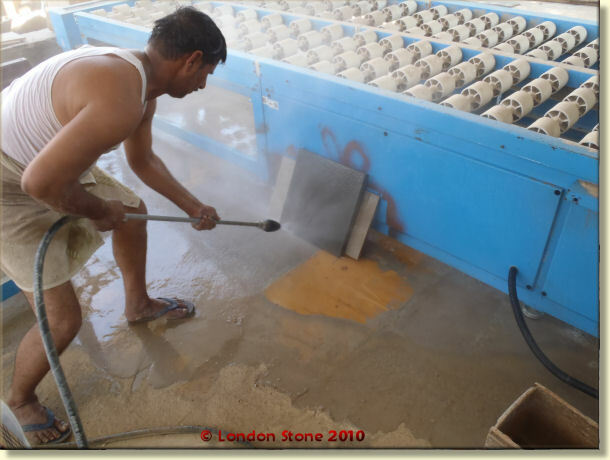 The first machine I came across was called the "water blasting machine" It performs exactly the same function as a shot blasting machine which is, to add texture to the surface face of natural stone. It is in essence an extremely powerful jet wash. Although the machine wasn't fully set up yet I was given a demonstration of the raw power of the water jet. 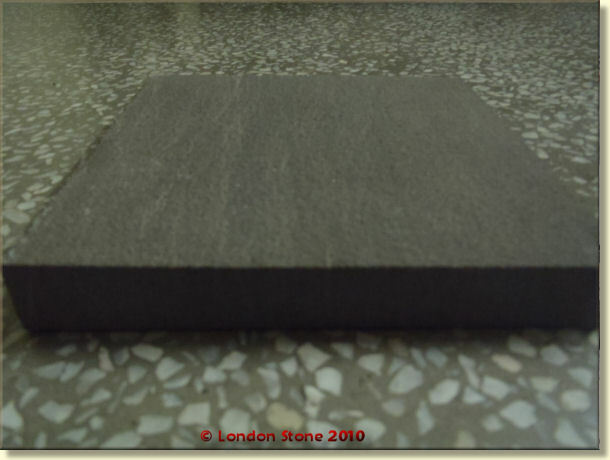 I was amazed as I witnessed a honed piece of sagar black sandstone given a once over with a "jet wash". In the space of about sixty seconds it had the texture and appearance of a piece of stone which had been shot blasted! 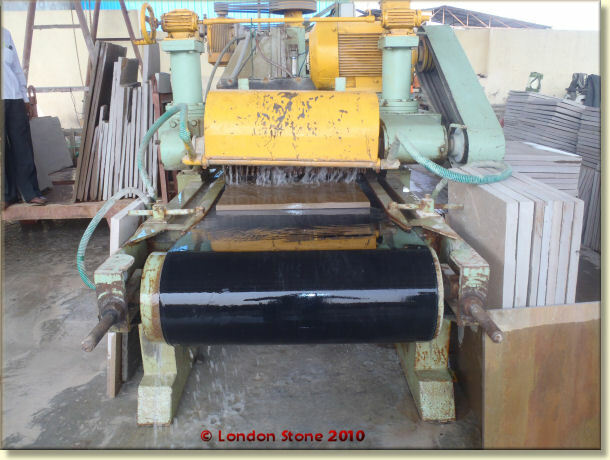 Anybody who has cut Sagar Black sandstone will testify how hard this stone is. When the machine is fully set up the water blaster will be mounted onto a CNC operated head which moves left to right as a production line rolls beneath it. 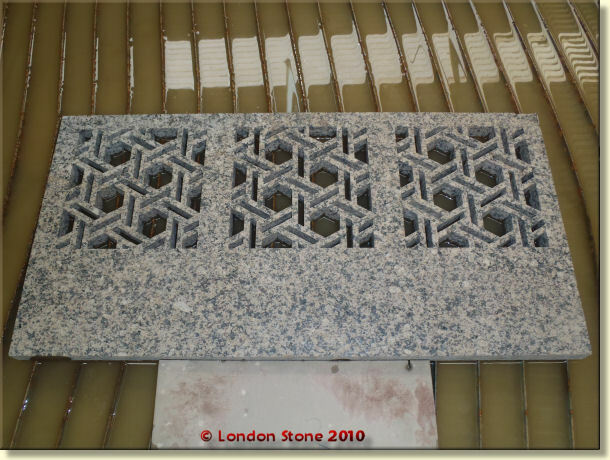 Another advantage of water blasting is that the colour of the stone is slightly enhanced by the process. Not to the point of being shiny but just enough to make the colour of the stone a little bit richer. 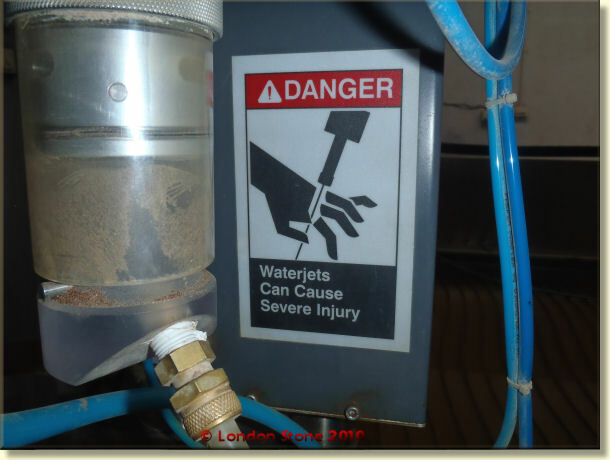 The second machine being installed was a water cutting jet. 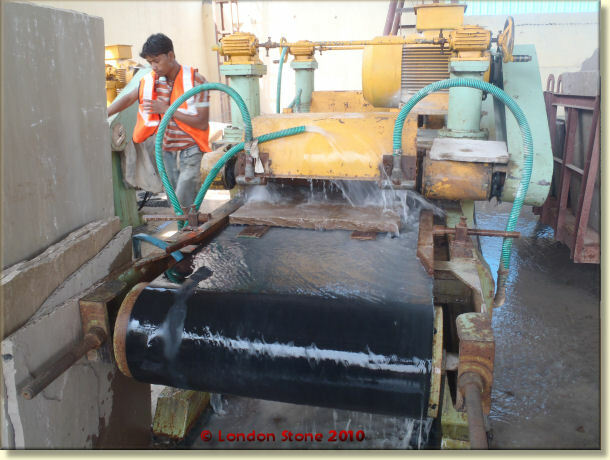 A water cutting machine is nothing new to us but is considered to be innovative for a small Indian paving producer. 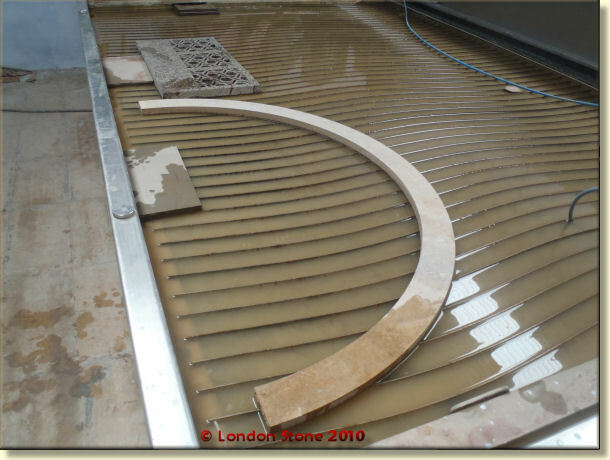 The water jet is CNC controlled and can cut to a depth of 100mm. CAD drawings can be programmed in and the machine is just left to do its job. 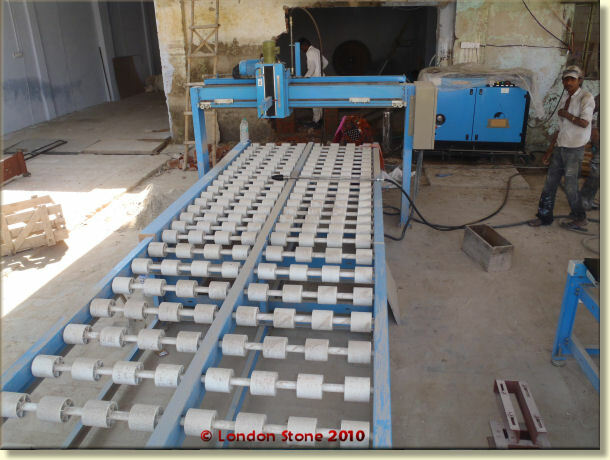 The pictures clearly demonstrate the effectiveness and versatility of the machine. The design options are endless, you could take this as far as your imagination could go. 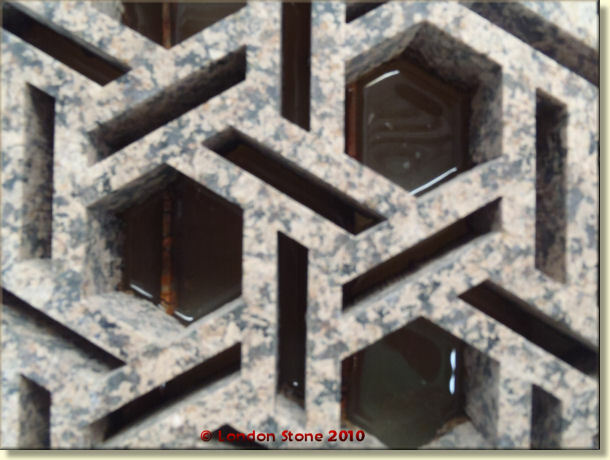 Were not just talking about sandstone here either, the piece of stone with the hexagon detail is rock hard granite. That was the end of the first day. I had been on the go for about 29 hours now so we decided to pack up and head back to my supplier's house. Saw a couple of things on the way back that were definitely not cutting edge technology and gave me a little reminder that we were still in India. First there was that old favourite of a pylon installed in the middle of the road. Secondly were the two feet pot holes. I thought the potholes on Worton Rd in Isleworth were bad enough. My personal favourite which unfortunately I didn't photograph was a roundabout being tarmacked while the cars were still going round it. I could not believe my own eyes. Finally someone with half a brain came up with a solution, send the cars round the other way! So we performed a U turn on the roundabout and started to head round it the wrong way into oncoming traffic. What could possibly go wrong? 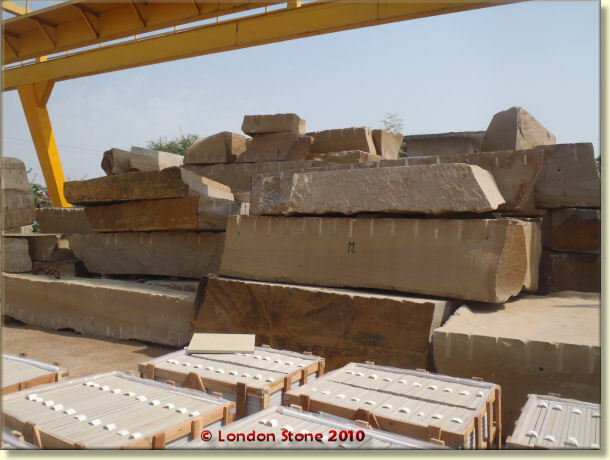 Kota is the heart, lungs and backbone of the Indian sandstone industry. I had arrived in Kota the previous evening after a fairly perilous drive. We had left Jaipur at about 3pm the previous day with the plan to reach Kota before nightfall. Unfortunately we had set off a little late which left us with the grim task of completing the last 1½ hours of the journey in darkness. The road from Jaipur to Kota is fairly narrow and is breaking up all over the place, with huge potholes littered around the road. We had to negotiate dogs, cows, motorbikes, pushbikes and other cars. Not to mention the constant procession of trucks streaming between Kota and Jaipur. Everybody drives using full beam with no exceptions. The result is that that you are completely blinded for the majority of the drive. Potholes, bikes and cows will literally spring from nowhere and the driver was constantly having to brake sharply and make last ditch manoeuvres to avoid hitting anything, especially the cows which are considered sacred to the Hindu religion. It was also not uncommon to drive round a blind blend to be faced by a truck on your side of the road attempting to over take another truck. India actually has fairly strict rules and laws in place but nobody pays much attention to them. I have never been so pleased in my life to reach the sanctuary of the bumper to bumper traffic which starts to build up a few kilometres outside Kota. We had reached Kota in one piece and after a bite to eat and a couple of well deserved Kingfishers it was off to bed, for the next day was to be a busy one. 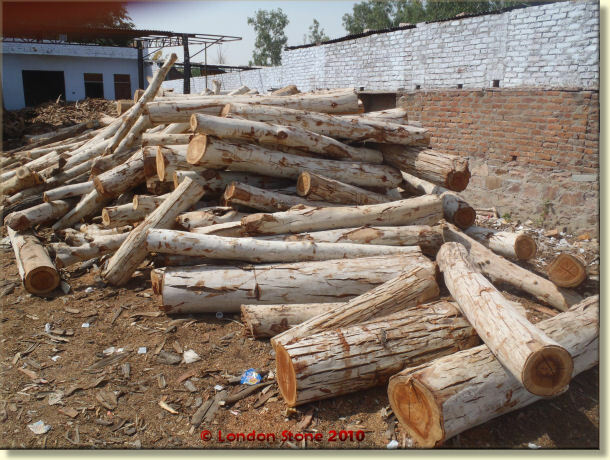 I met up with a new supplier the following morning and we began to visit every single one of his seven stock yards based in and around the stone market in Kota. 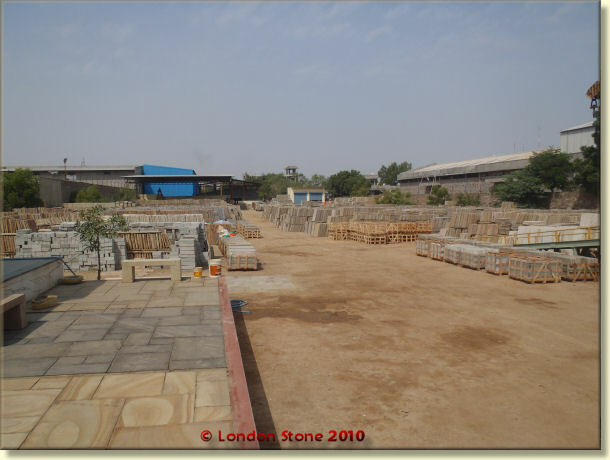 Situated just outside the main centre of Kota the stone market is a large concentration of stone producers next door to one another in every direction for a couple of miles. From the tiniest little producer making bits and pieces for the domestic market to the enormous stone shipper's site, the concentration of stone producers in this area is phenomenal. This factory is where the majority of our supplier's calibration is carried out. Over the past couple of years calibration has become more and more widespread. It offers cost saving benefits to manufacturers, importers and installers. Neat stacks of freshly calibrated Kota sandstone were stacked up awaiting packaging and mountains of sandstone block pavers were piled up waiting to take their turn on the overworked calibration machine. 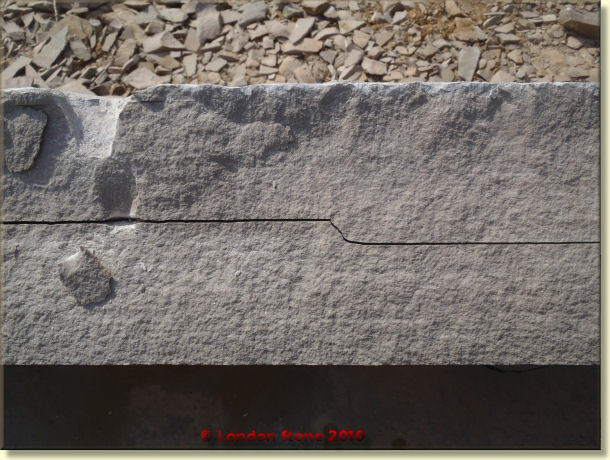 The quality of the finished stone was as good as anything I have ever seen, which was down to rigorous quality control. Every crate must be numbered and signed off which means that any quality issues can easily be traced back to an individual. The result is that the staff are extremely thorough with material packed for shipping. 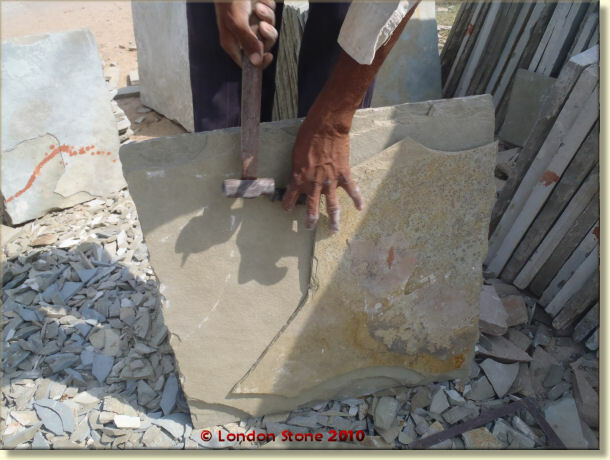 Any material not up to standard is either set aside for the local market or sent back to the stone masons for further dressing work. The rabbit warren type lanes which connect the stone market are a hive of constant activity. 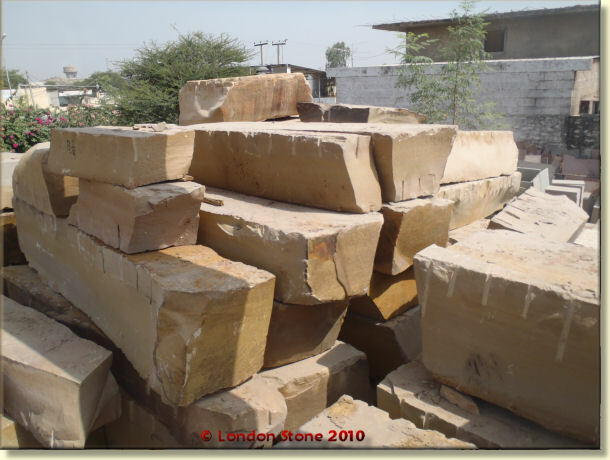 Large trucks roll through with massive blocks of sandstone from the nearby quarries of Bhudpura. Smaller lorries arrive packed with layer upon layer of sandstone to be hand dressed and packaged. If motorized transport is not available or unattainable then there is always the trusty camel. 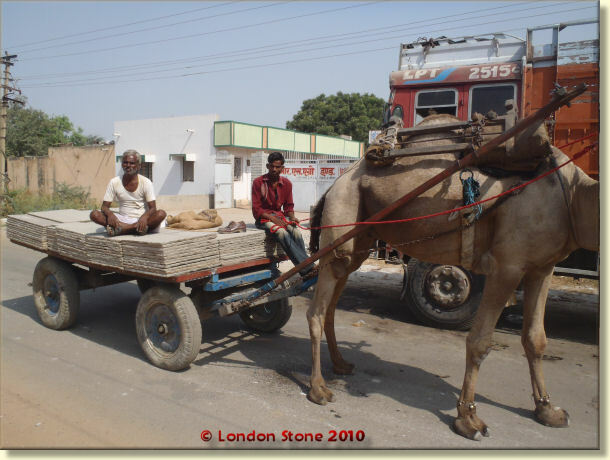 This method of transporting stone is common place in Kota. The sheer scale and continuity of the movement of stone in this area is staggering! I always marvel at the ingenuity of the Indians. They will always find a way to get something done. After leaving the first yard we headed over to a small unit which constructed crates. This particular supplier produces all of their own crates from scratch, with a saw mill constantly chopping up logs into the timber struts and bearers which form the crates. All the waste timber was bagged up and sold to the local people for firewood. While I was there a constant stream of people queued up at the medieval scales which weighed out the firewood bags. Nothing was wasted. After visiting a number of further stock yards we replaced the car with the 4x4 jeep and headed out to Bhudpura to see the mines. The first time I visited Bhudpura was 5 years ago. A highway has since been constructed making transport and travel in this region much easier. The mines stretch for miles along the highway and run almost as far as the eye can see. 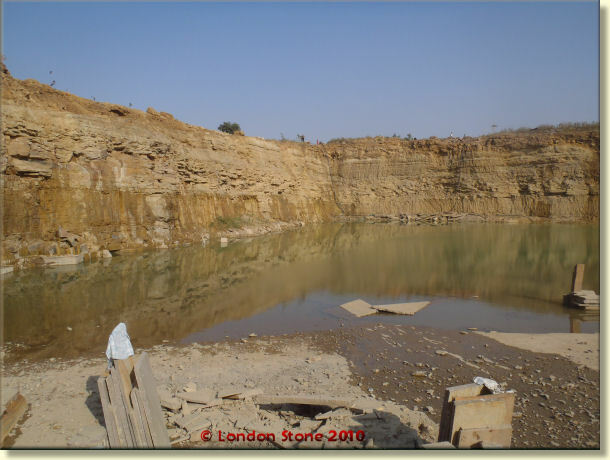 The recent monsoon was a particularly heavy one and the majority of the mines we visit are heavily water logged. Any mines which had quickly drained are put straight back to work and even the half drained mines were working at a limited capacity. 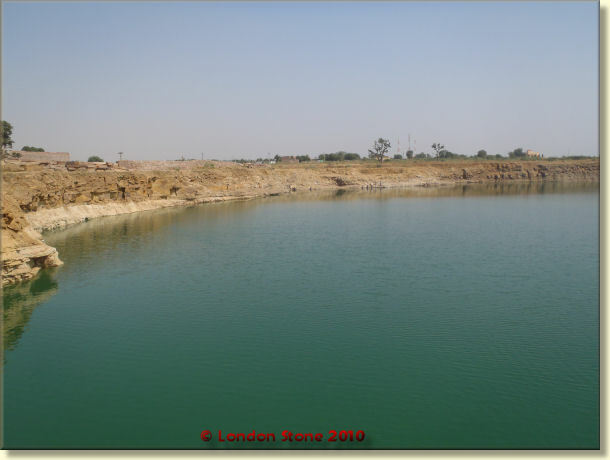 We found a Kandla Grey sandstone mine which, while still half full of water, was still operating at a limited capacity. Massive blocks of Kandla Grey were being separated from the face using nothing but sledgehammers and chisels. Three Indians worked away hammering the small chisels into the slab with incredible force and remarkable accuracy. Eventually the seam is cracked open and using crowbars the massive 10 ton slab is prised away from the rock face. 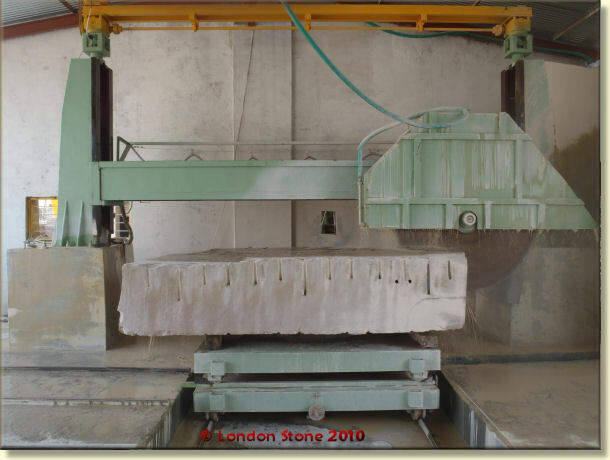 The slab will then be split again horizontally before being loaded onto a lorry and delivered to the next stage of production. The blocks will be split horizontally into two again and again until they are at the correct thickness for exterior paving. Before the blocks can be split they need to spend a couple of months drying out in the sun. 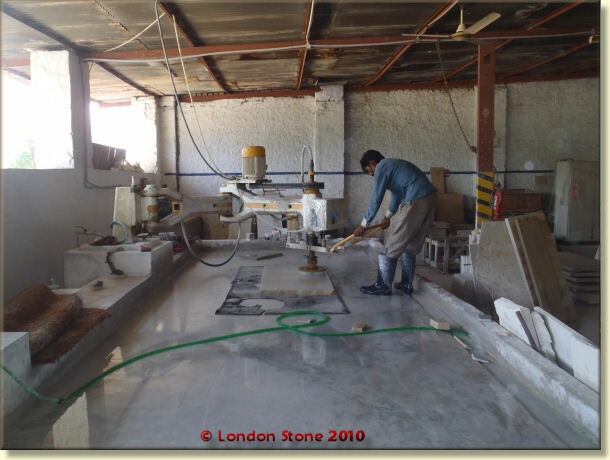 The splitting process will be made much easier and the stone will split more evenly if the block is given enough time to dry out. 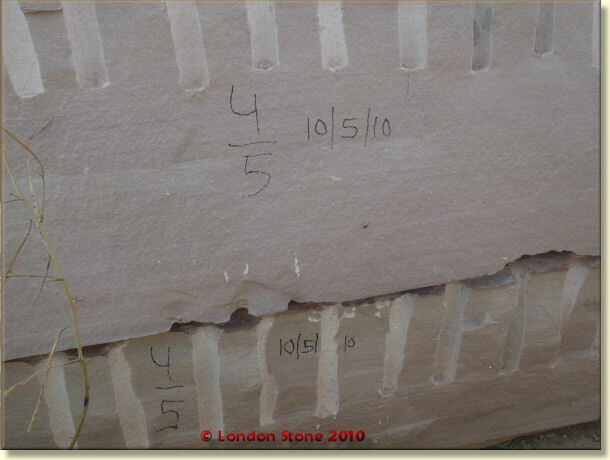 All blocks are marked with the date to ensure they are given enough time to dry out. I was eager to witness a block being split, so even though the block was not quite dry enough to be split they were happy to show me how it was done. Using a small, sharp chisel and a heavy hammer the stone mason will hammer along the seam. The seam will gradually open up and the slab will completely separate from the block. The stone mason was doing a fine job of splitting the block until the seam broke, which was as a direct result of the block being too damp. 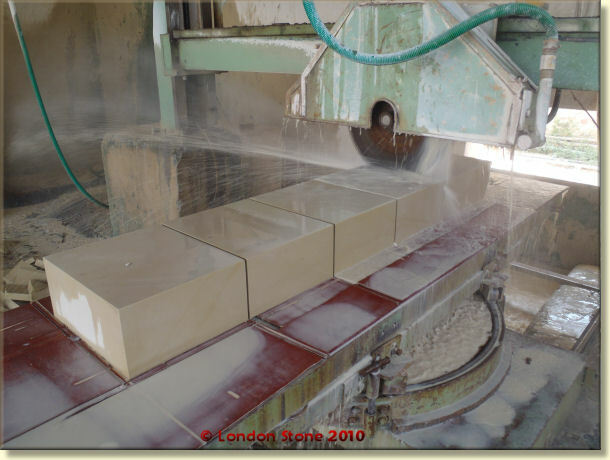 One of the reasons that established companies can supply better quality stone is that they have the financial resources to hold the block until it is completely dried out. Whereas smaller companies with fewer resources will be under financial pressure to get the block split, cut into paving and then sold as quickly as possible. 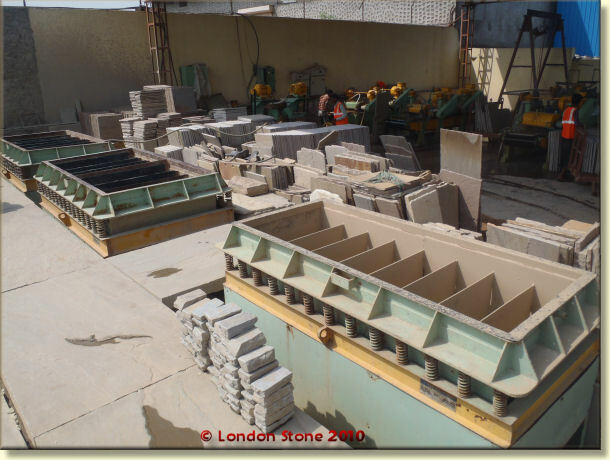 We then visited a small site which was splitting the blocks down to produce the final sheets of stone which will be ready for hand dressing into paving. The final visit of the day was to the cobble village in Bhudpura. This is a village which makes nothing but hand cut sandstone cobbles (Ed: setts, actually). This village has been the subject of intense media attention over the last 2-3 years due to the high levels of child labour which have been used to produce the sandstone cobbles. I had first visited this village 5 years ago and witnessed the disturbing site of children as young as five years old producing sandstone cobbles. 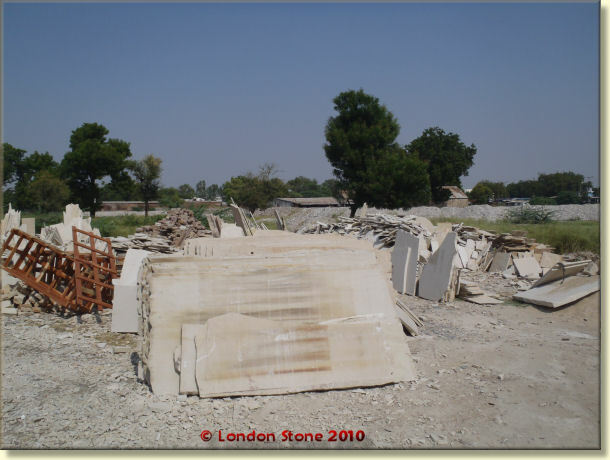 Ethical trading has had a big impact on the stone industry since then and I was keen to see if there had been any effect on the ground in Bhudpura. The cobble village is a long street with small independent cobble producers on both sides of the road. 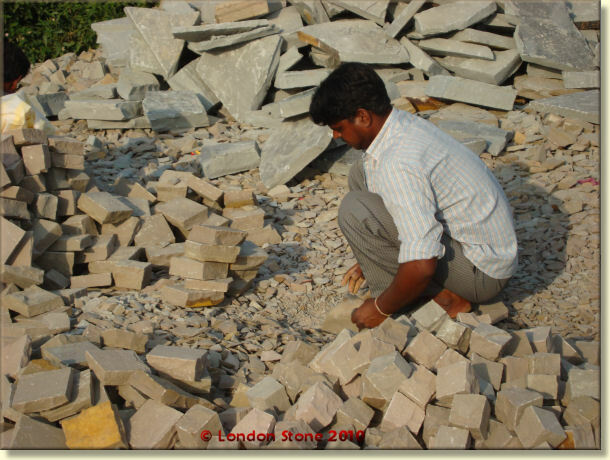 London Stone are ETI corporate members and the visit to the village was required to fulfil our Ethical trading objectives. Arriving at my supplier's site I was met by a clean, organised and productive yard producing cobbles. 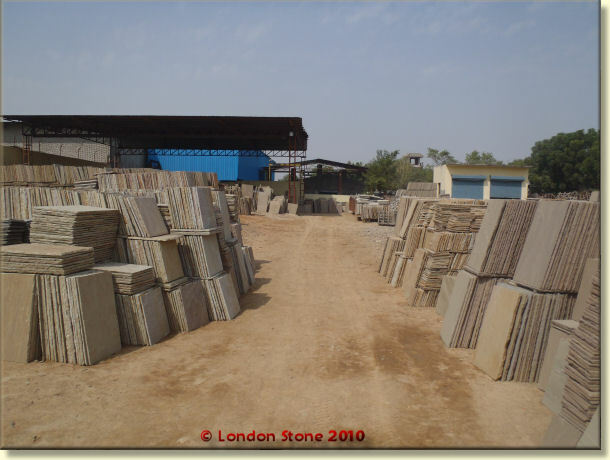 The cobbles are generally produced from thick waste slab, which is delivered to the village by the truck load and deposited in piles around the yard awaiting dressing. The people working the cobbles were a mixture of men and women aged from 16 -60. 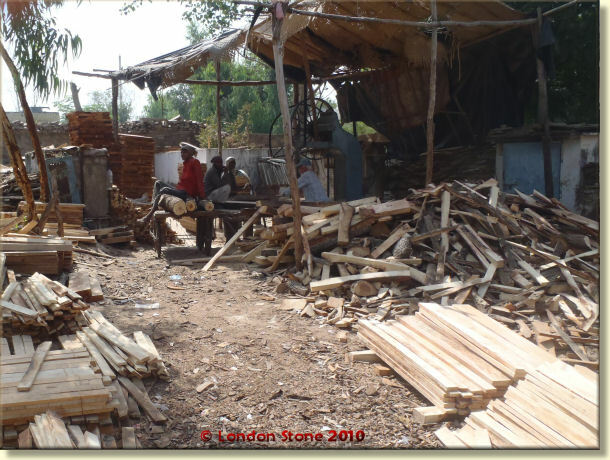 If it was at all possible I was keen to look at some of the independent suppliers in the village but I knew I would need to tread carefully in order to gain access to sites with which we had no working relationships with. My supplier understood my reasons for being there and told me I was welcome to stop the car at any point and visit any working site I chose too. I took him up on this offer and dropped in on half a dozen small independent production sites. While I did not witness any children working I did see children in and around the cobble yards. The sad conclusion I have drawn is that child labour is still involved in the production of sandstone cobbles in Bhudpura. The main areas for concern are the families of migrant workers who actually live on the production sites. There are schools in Bhudpura for these children to attend but it's going to take time, information and a lot of support before the problem of child labour is eradicated from this region, if it ever will be. 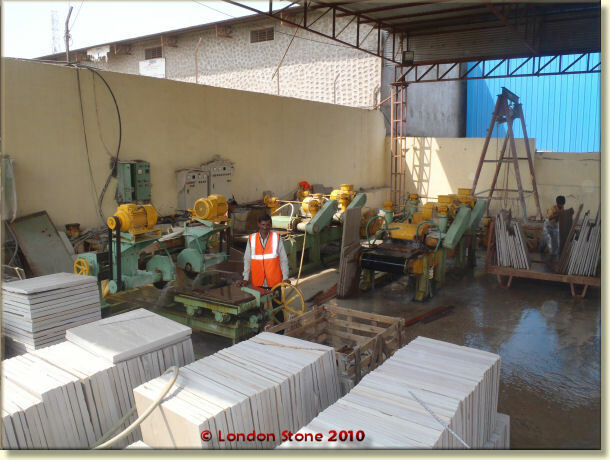 The introduction of calibration, the growing popularity of sawn stone and the general mechanisation of the stone industry in Kota is transforming the way natural stone is produced here. However sandstone cobbles will always be produced from waste. 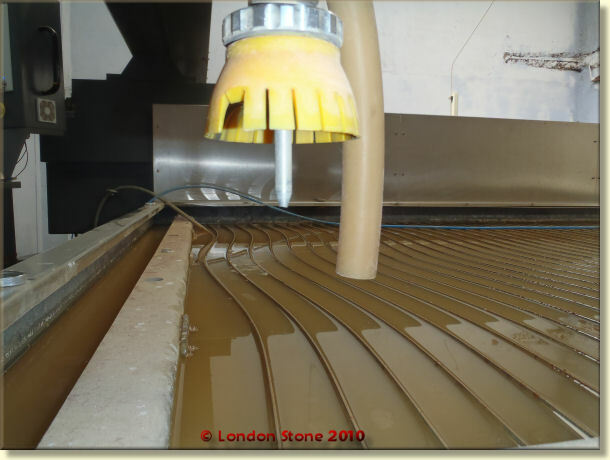 London Stone source natural stone from all over the world and our risk assessment correctly identifies the production of sandstone cobbles as the key area of exposure to child labour. 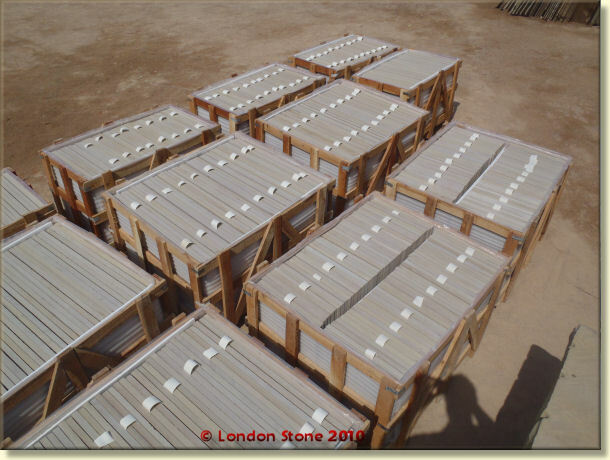 London Stone only work with suppliers who are certified and follow the ETI base code. In addition to this we will carry out due diligence on any supplier we use and it is not uncommon for us to spend 1-2 years negotiating with suppliers before we commit to placing any orders. Driving back from the quarries it had been an exhausting day. Today I was visiting another one of our Kota based suppliers. 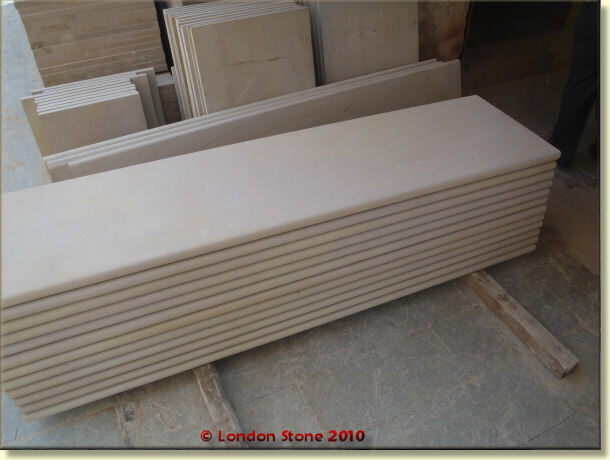 This particular supplier produces some of our sawn sandstone paving products. This supplier is extremely organised and his yard is an impressive site. 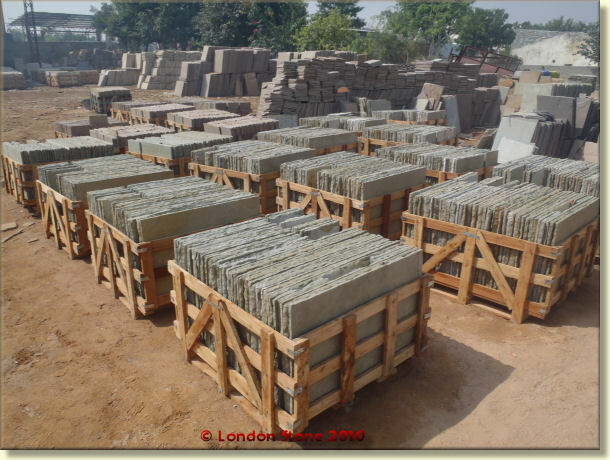 Driving through the gates you are faced with neat, organised rows of sandstone paving awaiting packing. 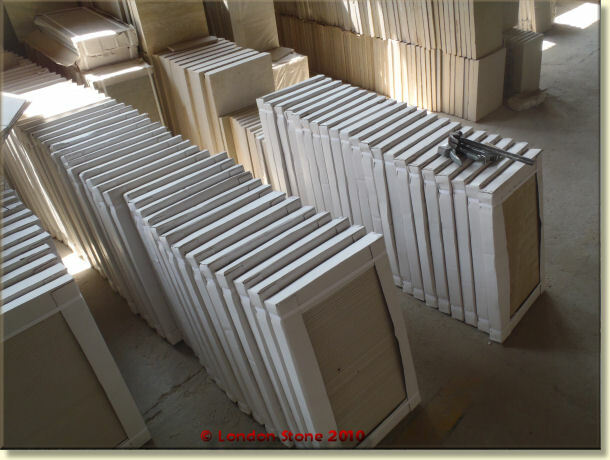 November and December is a quiet time for Indian sandstone producers as in general customers like ourselves are running down stocks for the winter period. However I was informed that these stocks would be quickly depleted come January once the orders start to come in. I was taken down to the new tumbling plant which had recently been renovated and fitted with three new tumbling machines. 75% of the workers were wearing hi visability and 50% of them were wearing safety boots. I asked my supplier why all the men were not wearing boots. He said that it takes a bit of time to change the habits of the staff. Some of these staff have been stone masons for 20 years and the idea of wearing PPE is alien to them, however it was good to see that most of the younger staff seemed to be wearing the PPE. There is even CCTV in this factory, though I imagine the motives for its installation are as much down to productivity as any other reason. 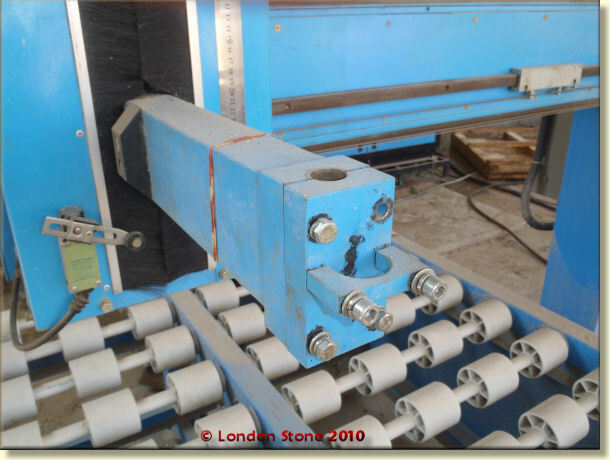 There were 3 calibration machines working away reducing stone down to the now universal thickness of 22mm. 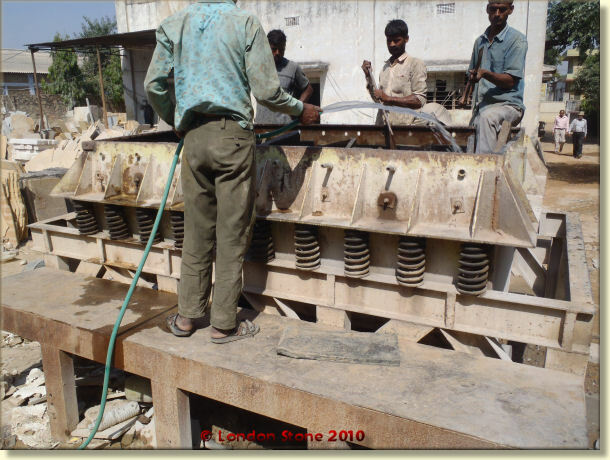 The mechanisation of the Indian sandstone industry is taking pace and it represents progress in terms of reduction of child labour, greater health and safety standards and by de-skilling the work opens up this massive industry for people without stone mason skills. 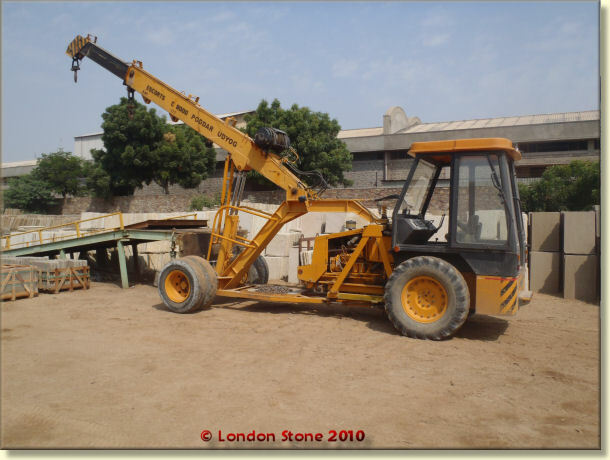 The majority of Indian factories use these awkward shaped cranes to transport crates and blocks around their sites. I have never been too impressed with them but I am told they offer a bit more versatility than a forklift. 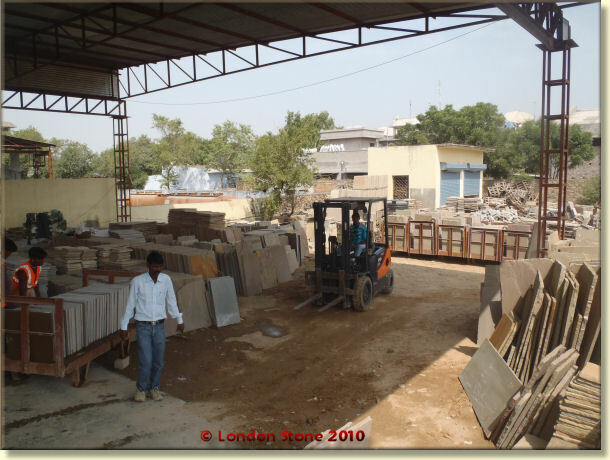 However I was pleased to see a forklift truck in this factory, a rare site in India. The operation here is incredibly efficient and shows that India is moving forward at pace. One thing which is certain with all the mechanisation of the industry is that smaller independent companies will be gradually squeezed out of the market. This is a sad state of affairs but a natural result of progress. One benefit of this is that the implementation of regulations and standards will be easier. 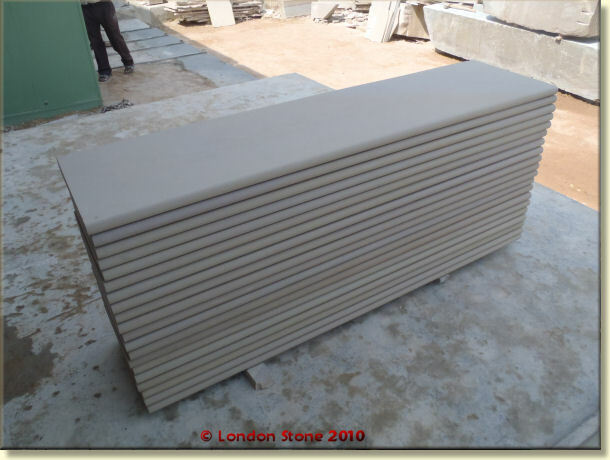 We then went to the next factory to see production of our sawn sandstone paving and sawn sandstone garden furniture. Arriving at the new factory I was met by the satisfying site of piles and piles of raw block material sitting beneath the imposing gantry. This particular gantry can carry up to 28 tons however most of the blocks are in the 3-5 ton bracket with the occasional ten ton monster block thrown in for good measure. The Gantry picks up the blocks and transports them to the waiting trolleys which sit on rail tracks on the edge of the saw sheds. 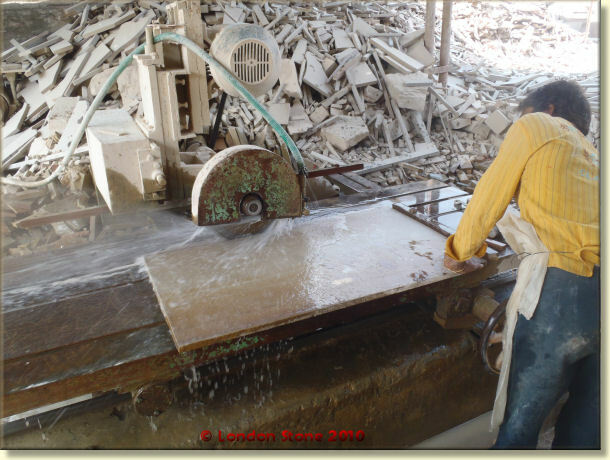 Once positioned onto the trolleys the blocks can then be easily rolled down to the block cutter where the massive saw blades cut these blocks into 25mm slices. The consistency of thickness is impressive with a maximum cutting tolerance of 2mm. The blocks are not cut through all the way to aid transportation around site. The block then awaits the edge cutting machine where they will be cut down into paving sizes. The final process is the shot blasting which provides texture to the surface of the paving and stops people from falling over on it. The stone is then carefully packaged up to avoid any damage during transit. Note the white straps between the pavers, put there with the best intentions we have discovered that they can mark the surface of the stone. They were removed on request. I also witnessed the production of some of our bespoke garden furniture pieces and this pile of bull nosed step treads had just been shot blasted and were now ready for packaging. I had visited this factory last year and the improvements made are marked. I was now driving on to Khera to visit my final supplier. This time we left early in the afternoon to try and avoid any night driving. 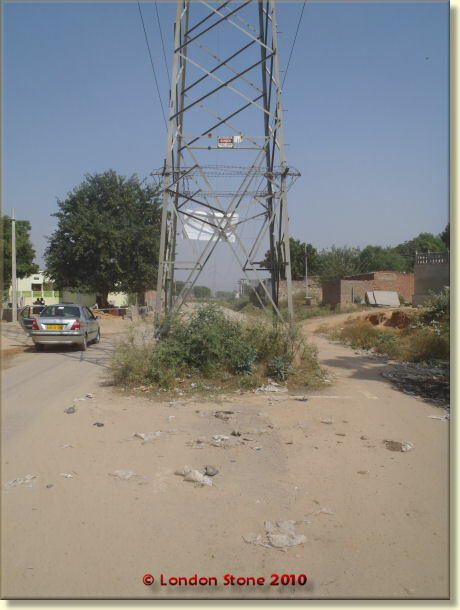 The drive to Khera was extremely pleasant and we drove through miles and miles of Indian countryside occasionally passing through a village or a small town. 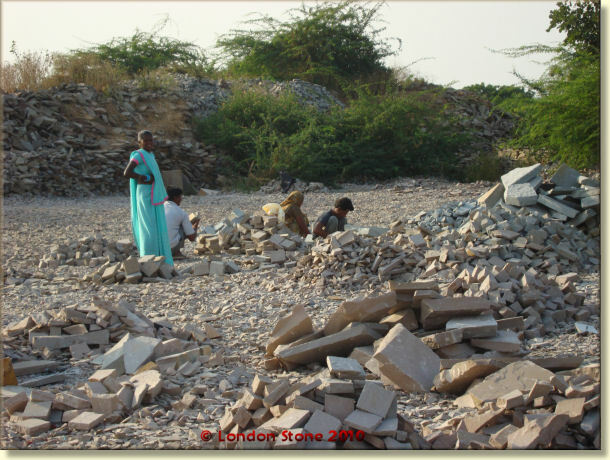 Stone is used for everything in Rajasthan. Fences, houses, roof tiles, steps, bridges over drainage channels, the list goes on and on. The Hindu religion states that it is a sin to harm any living creatures. The knock on effect to this is that there is an abundance of animals. On the way we saw mongooses and peacocks in addition to the usual cows, dogs, goats, pigs and squirrels. I arrived in Khera at 7pm on the evening of the 25th to meet my final supplier of the trip. After spending a couple of hours checking my emails and catching up with some paperwork I was taken out for a meal by my supplier. One thing you can always be sure of in India is amazing hospitality and I was dropped back to my hotel later in the evening having eaten far too much. The majority of the population in Rajasthan are vegetarians and when you get out into the sticks although meat is available it is best to stick to the vegetables. I awoke the next morning still full from the night before to be faced with a six course Indian breakfast. One of the biggest mistakes you can make in India is to finish your plate of food off because it will be instantly replenished before you can raise an objection. After breakfast we headed down to my suppliers factory to take a look at the facilities. 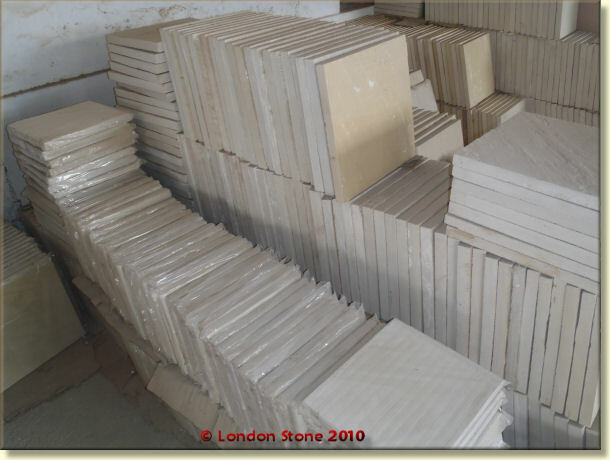 This supplier supplies the majority of our sawn sandstone products. 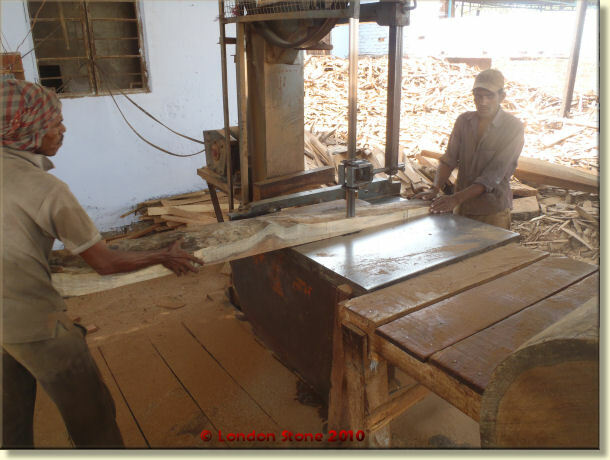 There is a wide range of different finishes emerging from India at the moment and one of these is called "brushing". 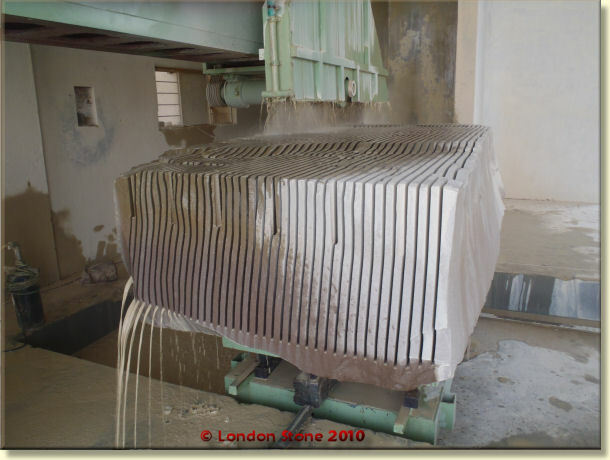 Brushing is when the surface of the stone is machine polished with a stiff circular brush head. The result is a smooth, but textured surface. This finish is also known as antiqued. A side effect of brushing is an enhanced surface colour. 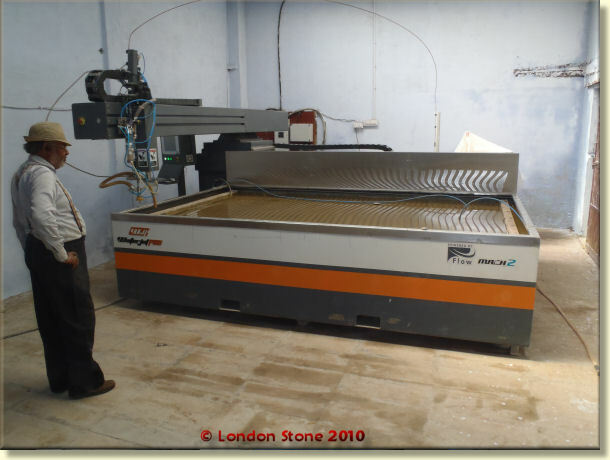 There was a production line of edge cutting machines which converted large slabs of sawn sandstone into finished paving slabs. 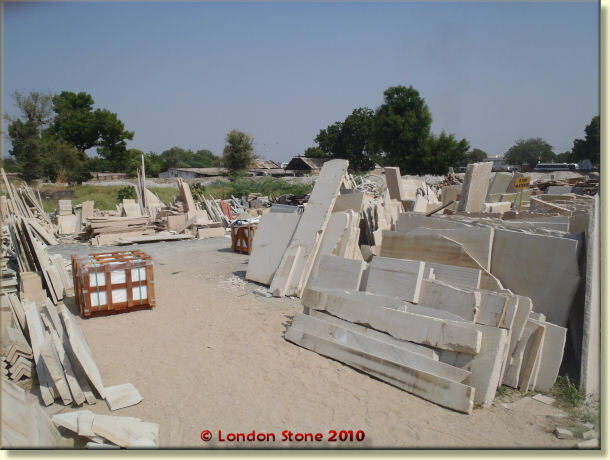 My supplier was eager to show me his natural stone graveyard. 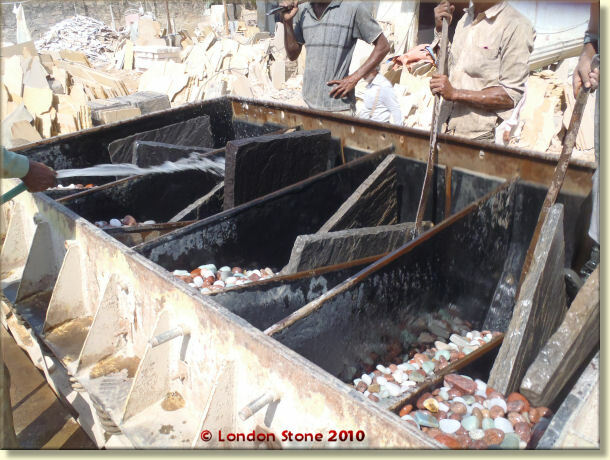 In my experience every stone supplier has a graveyard. 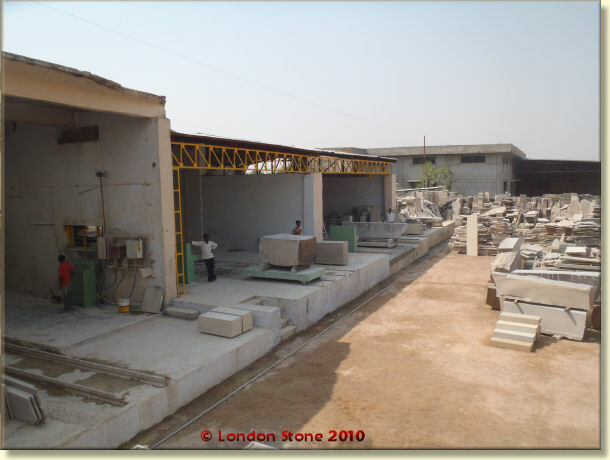 A graveyard is where you store, end of line product, defected material, off cuts and returns etc. My supplier was throwing all sorts of crazy products and sizes at me and offering them at bargain prices as he was desperate to reduce the size of his graveyard. I could not help but to sympathize with him, as we have to put a lot of effort back in London to keep our graveyard at a manageable level. This supplier sends a lot of material to Australia and it was interesting to see the different packaging standards that are tolerated down under. All the stone was for exterior use yet it was packed in cardboard boxes and some pieces were even packed individually in plastic bags (we attempted this method of packaging once but the amount of waste plastic was horrendous). I am also informed that the Australians are much more rigorous about what can be imported and implement stricter fumigation standards on all material going into OZ. I now had a three hour drive back to Jaipur where I would be flying to Delhi from the next morning. The trip had gone very quickly and now heading back to Jaipur with all my business completed I had a bit of time to reflect on the trip. The overriding feeling I had was of the speed of the progress taking place in India. 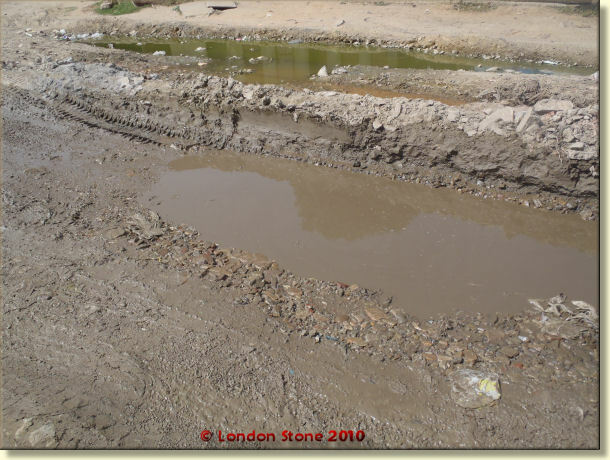 When I first travelled to India 5 years ago for example there was no highway to the quarries and I remember that particular journey being an absolute nightmare. Kota itself was also developing fast with Wal-Mart & McDonalds a sure sign of Western influences. One thing that hasn't changed and probably never will is the power and influence of India's most revered resident, the holy cow. Sacred to the Hindu religion the cows rule the roost in India. They are answerable to nobody and do whatever they want. It's not an uncommon site to see half a dozen cows strolling brazenly down the wrong side of a highway, asleep in the fast line or crossing the road whenever they feel like it. If a cow is crossing the road then you better be sharp on your brakes or quick on the steering wheel because one thing that is certain in India is that the cow bows to no man.